Growth hacking is the buzzword for business marketing. It’s what everybody is talking about, but what exactly is growth hacking? The phrase growth hacker was coined by Sean Ellis in 2010 and it’s catching on in startups and business fast – we all want to grow incredibly fast, acquire millions of customers and dollars in revenue. In a nutshell, growth hacking is a marketing technique that uses creativity, innovation, analytics and social metrics to gain exposure, sell your products and grow. To understand more about what a growth hacker does and apply the same principles to your business, I have some examples and tips from industry leaders on how they used growth hacking to quickly expand their business. Twitter is a great story for growth hackers. Everyone uses it and even if they don’t, they are aware of it and have most likely read someone’s tweets. Twitter conducted comprehensive testing on the user experience and interface and reinvented the entire product and continued to make changes to their system in order to provide users with personal value in Twitter and ensured dramatic growth and success. Twitter is inherently social in itself and while that isn’t easy to implement successfully in an everyday business, it still serves as a great example for a growth hacking success story. Quick Tip – Test and evaluate your user experience, design, marketing and technology with real visitors and build a better product than your competitors. Airbnb is a vacation rentals marketplace, connecting travelers and with some unconventional marketing techniques, it has grown into a billion-dollar business. To encourage residents to post their property listings initially on Airbnb, they contacted owners on Craigslist to acquire users. This tactic quickly earned thousands of users and the network rapidly went viral. Startups are often faced with limited marketing budgets, but turning to creative and innovative growth hacking strategies, such as utilizing the power of an already existing network should never be underestimated. Quick Tip – Be unique and use creative marketing techniques and existing networks to create brand awareness for your products and attract customers. 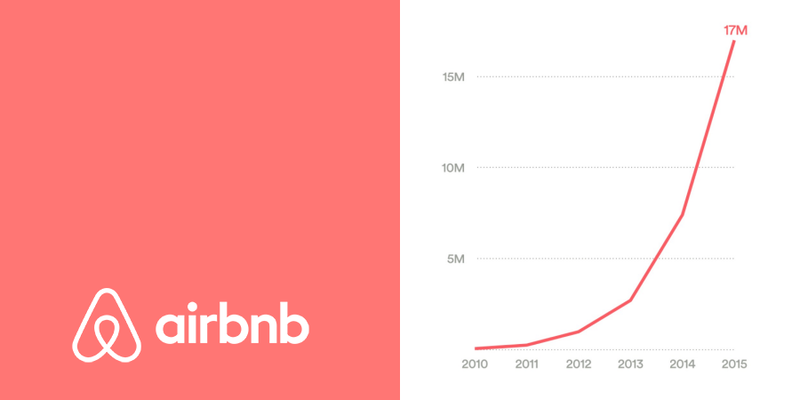 Airbnb's Summer 2015 Report indicates that their growth over the past 5 years for summer vacations has grown 353 times over with 17 millions stays. Another growth hacking success story is YouTube with their platform to share videos that has exhibited massive growth through it’s simple and effective growth hacking techniques. YouTube makes it easy for users to upload videos and share them with the world and your audience is presented with the ability to share and even embed videos on their own blog and website, spreading the word, and letting more people know about their service and creating virality. Quick Tip – Make your content easy to share and embed in websites to increase your visibility and expand your reach. Dropbox has encountered huge growth utilizing growth hacking. Drew Houston, co-founder and CEO of Dropbox, claims that referral incentives increased Dropbox signups by 60%. When a Dropbox user refers another individual, they both earn a 500 MB increase, provided the user signs up. 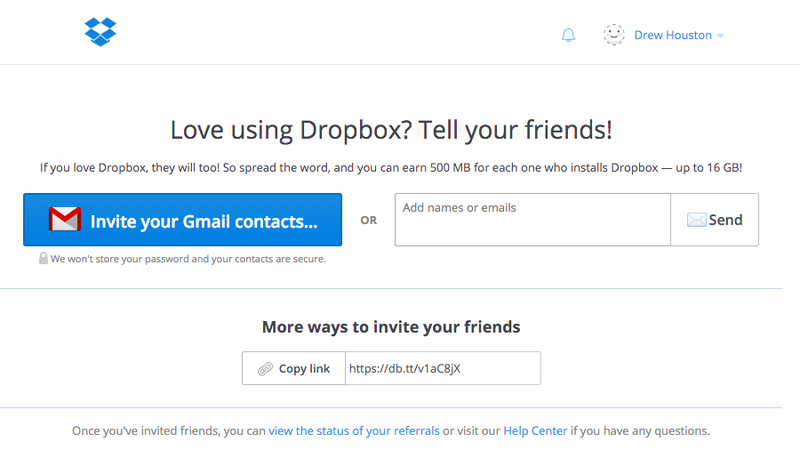 Not only does Dropbox makes it easy to refer and provide incentives to their users who do so, but they also instill an element of trust in these friend referrals and word-of-mouth programs. Quick Tip – Consider where you could add a referral program that benefits both existing customers and new customers to help grow your business quickly. In each of these growth hacking instances, you will notice a common theme, that each of the products are very scalable and using word-of-mouth to spread their message helping achieve exponential growth. In addition to these inspiring customer success stories we also have some tips that will immediately help you get started growing your business. Make something worth talking about, a truly remarkable product that people can get excited about it. It’s not about having friends in high places that can call a publicist and get you media attention to promote your product. It’s about having a product that stands out on its own and the marketer’s job is simply to convey communicate the idea to influencers to spread the message. Feedback from your customers is extremely valuable and essential to offer a product that excels above all others and gets attention. Collecting feedback and continuing to improve your product on a regular basis will enable you to meet customer’s expectations and continue to learn how you can improve your product. Ryan Holiday encourages you to reevaluate and consider Is your Product Terrible? Optimise, improve and refine your product until you have something that’s really special and stands out from everything else out there. Early on in your business, you should focus on customer retention and refining your product rather than growth. This may seem a bit controversial in an article that is talking about growth hacking. However, focusing on retaining your early adopters allows you to increase customer happiness and will result in a stronger product for when you are ready to formulate your growth strategy. As a great example, Instagram initially started as an app called Burbn and the app was focussed around a social geo-location sharing app with a multitude of features, which only a small part was uploading photos and sharing them with friends. The founders realized that the photo uploading feature was their strongest feature and decided to cut all other features and moved forward with the new app Instagram. The founders later went on to sell the company to Facebook for $1 billion only 15 months later. 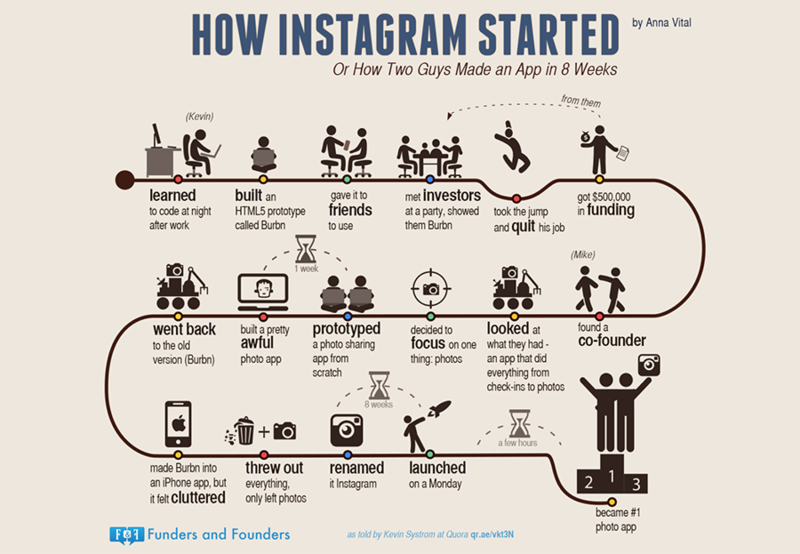 Funders and Founders illustrate Burbn's transformation into Instagram as told by founder Kevin Systrom on Quora. Finding faults and flaws in your product from customers early on will show you weaknesses that need to be addressed. Until you are successfully learning what your customers want, and retaining them, you’re not ready to drive new users to your product and experience real long-term growth. If the founders had of focussed on and persisted with growing the initial Burbn app instead of refining what the customers actually wanted, the future of their company may have turned out very differently. Over at Quicksprout, Neil Patel has an awesome guide that covers many aspects of growth hacking in 10 comprehensive chapters and is a great resource for getting growth started in your business. From an introduction to growth hacking, to actionable pull and push tactics to get more visitors, and activating your traffic to retain users, The Definitive Guide to Growth Hacking is an essential read. Another great community with all the latest growth hacking news, articles, videos techniques, and trending topics can be found at growthhackers.com. Check this out daily to sharpen your growth hacking skills. Want advice to improve and grow your business? Join our mailing list to receive the tips, advice and news from our team.